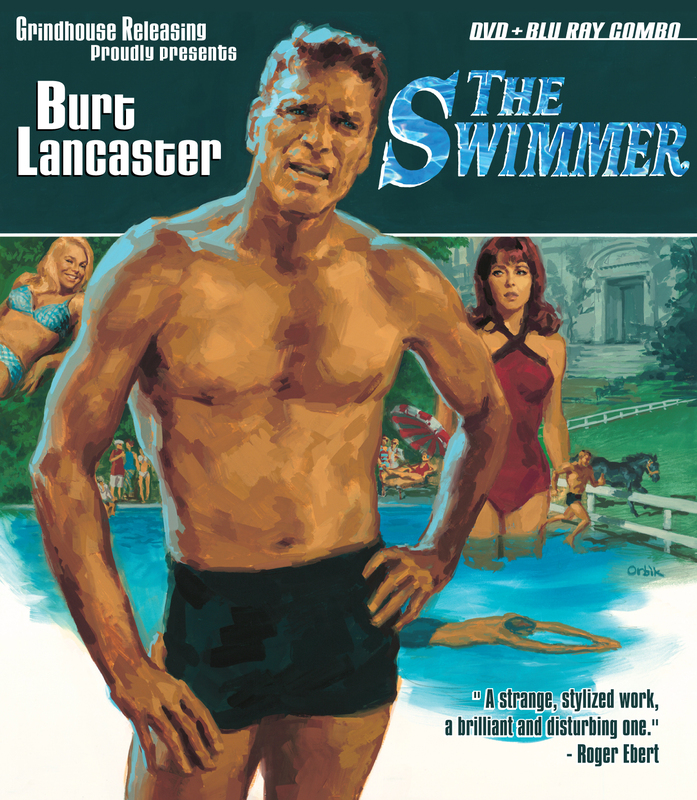 Grindhouse Releasing is proud to present Burt Lancaster in THE SWIMMER, based on the famed story by John Cheever, arriving March 25, 2014 on Blu-ray and DVD in a spectacular new collector’s edition. The film was directed by Frank Perry (DIARY OF A MAD HOUSEWIFE, PLAY IT AS IT LAYS, MOMMIE DEAREST) from a script by Eleanor Perry. The new Blu-ray/DVD set boasts a wealth of bonus features including the brand-new 2 1/2 hour documentary “The Story of THE SWIMMER” by Oscar winner Chris Innis. “The Story of THE SWIMMER” includes in-depth interviews with stars Janet Landgard, Joan Rivers and Marge Champion, composer Marvin Hamlisch, film editor Sidney Katz, assistant directors Michael Hertzberg and Ted Zachary, UCLA Olympic swim coach Bob Horn, and Joanna Lancaster. The new Blu-ray/DVD set features a vintage audio recording of John Cheever reading his famous story “The Swimmer”, which first appeared in The New Yorker in 1964. THE SWIMMER Blu-ray/DVD also offers a 12-page booklet with liner notes by director Stuart Gordon (RE-ANIMATOR), rare production stills from the lost alternate scenes, extensive still galleries, trailers, TV spots, and more. The cover art for the disc is a new painting by renowned Stephen King cover artist Glen Orbik (JOYLAND, THE COLORADO KID). THE SWIMMER is the latest home video release from Grindhouse Releasing, the company founded by Sage Stallone (1976-2012) and Bob Murawski and known for its restorations of Italian cult-horror classics such as Lucio Fulci’s THE BEYOND and Ruggero Deodato’s CANNIBAL HOLOCAUST. THE SWIMMER follows Grindhouse Releasing’s acclaimed Blu-ray collector’s editions of Sergio Sollima’s THE BIG GUNDOWN, starring Lee Van Cleef and Tomas Milian, Robert Hartford-Davis’ CORRUPTION, starring Peter Cushing, and Amos Sefer’s AN AMERICAN HIPPIE IN ISRAEL, starring Asher Tzarfati and Shmuel Wolf. Grindhouse Releasing has also issued Sage Stallone’s award-winning acclaimed short film VIC, starring Clu Gulager (THE LAST PICTURE SHOW, THE KILLERS). DVD Talk calls VIC “truly unforgettable – a must-see, must-own short film” and Cinema Retro hails VIC as “an extraordinary film that packs an emotional wallop”. THE BIG GUNDOWN, a massive 4-disc set of the celebrated spaghetti Western that includes Blu-ray, DVD, and the original soundtrack by Ennio Morricone on CD, was hailed as the “the Blu-ray release of the year…absolutely stunning” (DVD Verdict), “a must-see” (Blu-ray.com). “superb on every level” (Cinema Retro) and “first-rate…one of the best home entertainment packages of the year” (The Film Corner). Among the next Blu-ray titles from Grindhouse Releasing are Ruggero Deodato’s CANNIBAL HOLOCAUST and Lucio Fulci’s THE BEYOND, for which Murawski and Innis recently shot a new featurette on location in New Orleans. 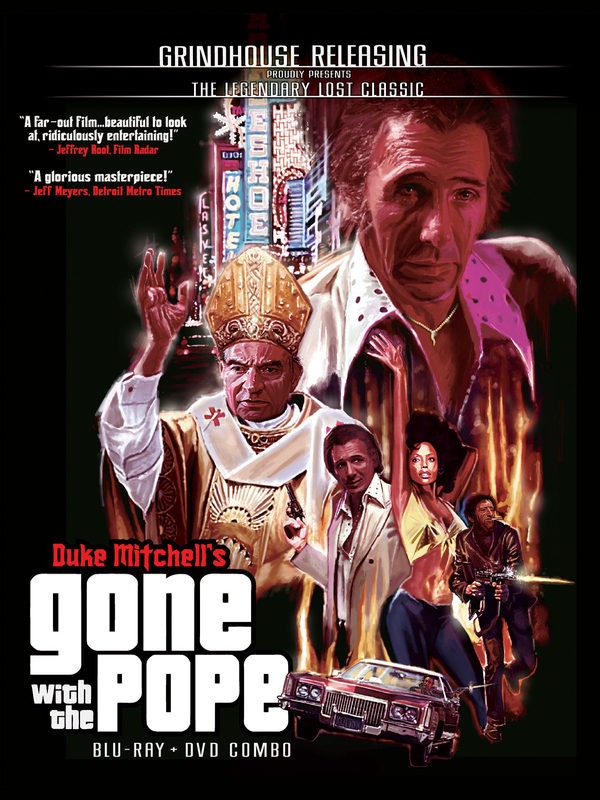 Grindhouse Releasing will also issue Fulci’s CAT IN THE BRAIN, Duke Mitchell’s GONE WITH THE POPE and MASSACRE MAFIA STYLE, Juan Piquer Simon’s PIECES, in a new 4K transfer, and S.F. Brownrigg’s SCUM OF THE EARTH. Burt Lancaster, Janet Landgard, Janice Rule, Joan Rivers. 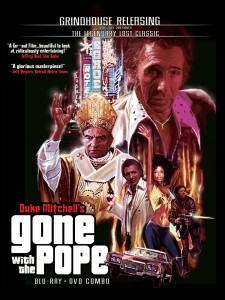 Director: Frank Perry. Rated: PG.